The Oxford English Dictionary defines a souvenir as “a thing that is kept as a reminder of a person, place or event”. For many years now there has been a corner of the mezzanine level at Headwater that is given over to a collection of classic souvenirs brought back by various people from research, contracting and educational trips, with one or two thrown in from personal holidays as well. Liberty Duck - how do you get by without one? The term classic souvenirs is used quite loosely – the object of the exercise is to purchase, for the least amount of money possible, the most pointless piece of tat that can possibly be found in the destination visited. You only have to browse the shops in any airport departure lounge and you’ll get the idea. It is amazing to think of serious minded business people gathered at board meetings to go through the design brief for some of the items on show. 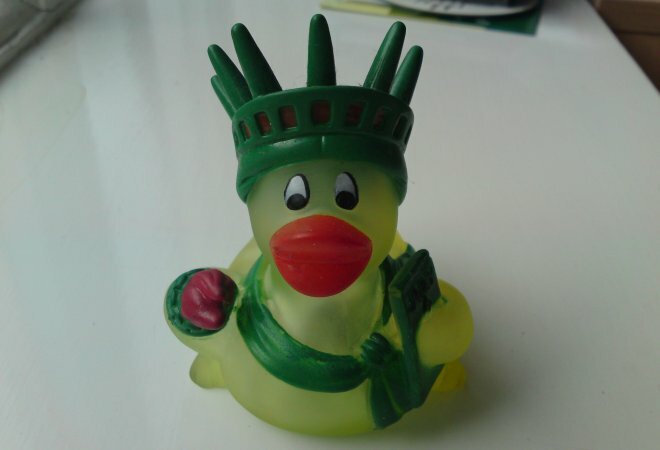 Contenders for most ridiculous include the Statue of Liberty Bath Duck. He was expensive at $6.99, but that was when $6.99 was only £3.50. A king’s ransom in Tat Corner terms but still an inspired choice by Heather, as not only does it fulfil no useful purpose, but it also flashes and squeaks (at least it did when it was bought). Well worth the extra investment I’m sure you’ll agree. Another hot favourite, especially when kids visit the office with their Mum or Dad is the Singing Moroccan Camel. He appeals to the kid in everybody, although once you start him off he’s hard to shut up. More details on the denizens of Tat Corner later, but if you have seen any souvenirs that can rival these amazing specimens and of which you are particularly proud, let us know! “The two most abundant things in the universe are hydrogen and stupidity”.